In a city obsessed with football, sun, sand, sea and Sangria, a place to chill out and relax with friends is always welcome. That's what we offer at St Christopher's Inn Barcelona and we offer it in a prime location - with self catering facilities! Located directly opposite the airport transfer drop off at Placa de Catalunya we couldn't be easier to find. Better yet, from this top backpacker hostel, La Rambla and the many attractions of Barcelona are only minutes away on foot! At our St Christopher's Inn - Barcelona, you will find a beautiful mezzanine garden, in-house cinema screen, outdoor eating areas and environment protecting solar panels on the roof. All our guests receive 25% discount on food at our on-site restaurant, plus great discount deals on drinks in our bar! 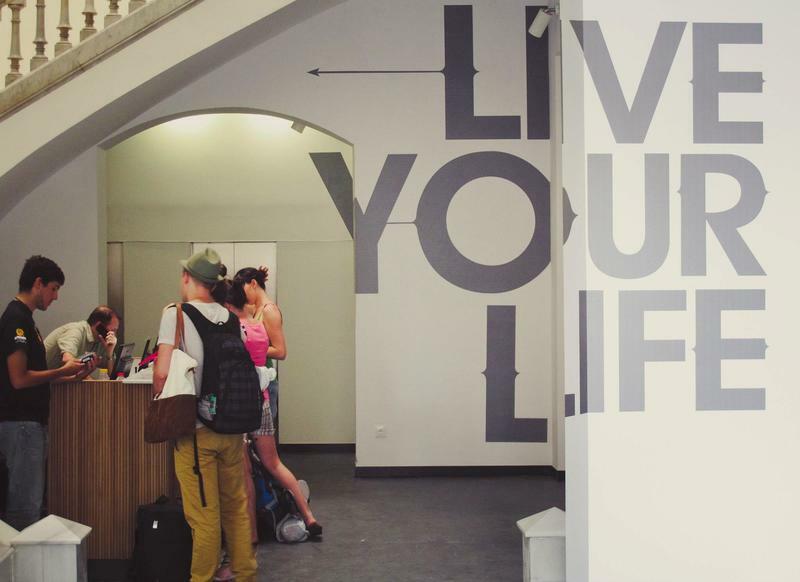 It's a benchmark for a new generation of hostels - so when you stay with us, be prepared for the time of your life. There's always something going on and great parties in our Belushi's Bar. We also have free WiFi in every floor in the building and in every one of the common areas and available computers to rent p/min, if you don't have your smart phone or your laptop. There is also a free breakfast for our hungry guests every morning. There's also something a VERY special for the ladies, our female-only rooms where you can escape the boys, enjoy a few extra comforts and hit the streets of Barcelona looking fabulous again. You can meet other like minded travellers by trying out our daily free walking tour and if you feel like, at night we can book you to a 'tapas' or a 'famenco' tour so you can live the real Spanish experience. Please note that we do provide linen, but remember to bring your own towel. There are large free lockers in the rooms but you also need to remember to bring your own padlock for security. If you forget it, do not worry... we will have them for you at our reception desk. Breakfast is free of charge for all our guests. The hostel also has large lockers, for daytime luggage storage, if you want to go out for some last minute souvenir shopping after you check out. You really won't have it any better in Barcelona than here!!!! 1. From Terminal 1 take Bus A1 destination Plaa Catalunya. - From Terminal 2 take Bus A2 destination Plaa Catalunya. - Buses leave every 10-minutes between 06:00 and 01:00. - Outside of this period night bus N17 connects the airport to Plaa Catalunya. - A single fare will cost approximately 6. 2. From the Plaa Catalunya bus stop, cross the plaza and walk along the Carrer de Bergara until you see St Christophers Inn on your right, just before Topshop. - After exiting turn back on yourself and walk down the Plaa Catalunya, with the plaza on your left. - Take your first right onto Carrer de Bergara and walk until you see St Christophers Inn on your right, just before Topshop. 1. Take the Cercanias train to Plaa de Catalunya. 2. Exit the train at Plaa de Catalunya. This journey will take less than five-minutes. - Take the first right and you will see St Christopher's Inn on Carrer de Bergara.